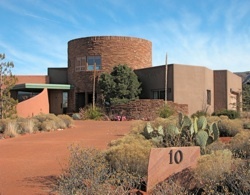 Baker: This home was included in the 2004 Sedona Home Tour. The owners, after being gracious hosts the first day, went and toured the other homes. They came back and said “this is the only house on the tour where there is life. In the other homes people are tiptoeing silently through. Here, everyone is talking and enjoying themselves as if they were neighbors”The owners hired me for this green home project without ever meeting me. 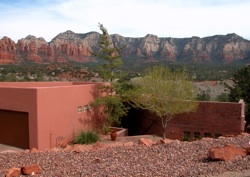 In my first contact with them, a phone call, they called to say “we saw one of your designs, a rammed earth home in Sedona, and we want you to design our new home”. Of course I said an enthusiastic yes! For a complete picture composite for this property, including thumbnails and slideshow, click here. 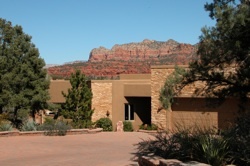 This was a home for the owner of the largest real estate firm in Sedona and his family. Done in a southwestern motif, it featured stained glass window, niche insert, lamps and sconces, and powder room mirror by Monika Cate of Cate Studio and Gallery. 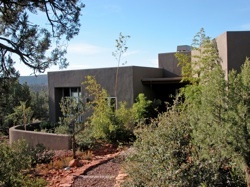 Walking homes under construction is a favorite pastime of neighbors in Sedona. One day late in construction, when I visited this new home, I found that someone had hung an inflatable Holstein cow from the ceiling fan in the living room – 14 feet off the floor – with a sign dangling from the bottom saying “holy cow, what a great house!” It hadn’t been hung there by the owners or the contractor. We never found out who left this wonderful compliment. An early foray into residential use of alternative building systems, this house, as the one which led to it, is built of light gauge steel frame. Light gauge steel is virtually all made of recycled steel. 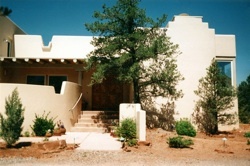 This was the first project done by Cate Design in 1989. 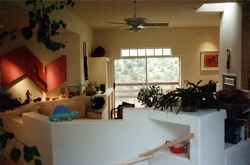 A small home on a hilly site, it was designed to take in the natural views, coordinate with the existing site condition, and be a gallery space for the clients’ collection of unique art. In its original design, the home was designed to use solar for electricity and heating. As former neighbors of the Bakers, Mr. and Mrs. Otts became enamored with the Bakers’ new home. The Otts’ new green residence which followed is designed to nestle into its naturally lush site with no disturbance of the existing context. The design utilizes several green technologies, including 12″ thick insulated concrete form (ICF) walls, non-toxic Icynene insulation in the roof and an air conditioning system so efficient that it provides air conditioning at the same cost as running a ‘swamp cooler’. The interior is designed to combine spatial movement with natural light and organic colors to achieve a very Zen-like atmosphere. 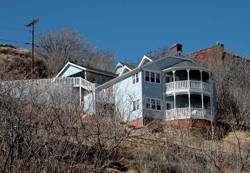 Said to be the most photographed home in town, this home was designed for a STEEP hillside in historic Jerome, Arizona. Due to the historic requirements of the town, the design had to emulate the surrounding historic architecture within the town’s strict guidelines. 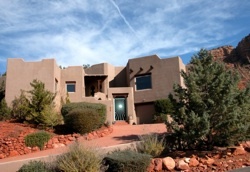 Small and big at the same time, the home features among other things a gourmet galley kitchen, sauna, and 50-mile panoramic views to Sedona and the San Francisco peaks. 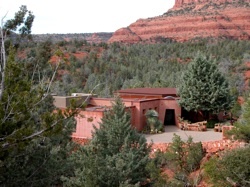 This was my second rammed earth green home project in Sedona. Built to harmonize with its surroundings, the two foot thick walls used earth from the site. 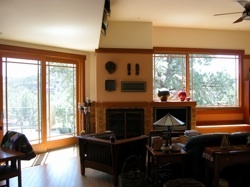 Featuring a fan-shaped great room, this and all rooms in the home are completely private in their direct view of the national forest which surrounds the home. 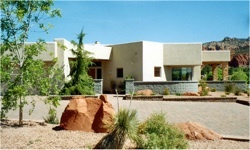 This was the second home designed as a speculative home for a local contractor. So successful was the sales process that a bidding war ensued. The ultimate owner later became a valued client as well. Designed as a luxury spec house for a local builder, this 3,400 square foot house featured a gourmet kitchen with formal dining room, outdoor dining area, luxury master suite and panoramic living room views, and sold very quickly. Known affectionately as the ‘tree house’, this unique green home was built on a heavily treed lot for a pair of bird lovers with an equal love of art and architecture. To attain views, the tri-level home puts the great room and master suite on the top floor, which gains face-to-face views with Cathedral Rock and is literally in the treetops, putting the owners at handshake level with avian life. The owners being lovers of my wife’s stained glass, the home includes many of her pieces, such as the front door and side windows, kitchen cabinet doors (which match the dining chair upholstery), dining room lamp, windows in the living room and space divider between master bedroom and master bath. Additionally, the house is built of R-42 SIP panels, uses renewable bamboo flooring and the same highly efficient – SEER 23 – air conditioning system as the Otts Residence. We have been to the house for dinner in the dead of winter (with snow on the ground) — and the heat never came on. 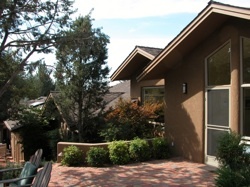 In this addition and remodeling project, we added 1400 square feet to a 2400 square foot home. Since the owners couldn’t see the beautiful views for the existing low eaves, rooflines were changed to achieve open views and more architectural interest at the same time. Included in the addition was a master suite incorporating master bedroom, master bath, his and hers walk-in closets, workout room and meditation room. Another unique feature was the sound-isolated and acoustically designed music room for one of the owners, who is a composer and musician. And as with some other designs, the end result of the design was a very indoor-outdoor home with a tranquil, Zen-like feel. As with all good addition and remodel design, it is indistinguishable where the new was added to the old. It looks as if the house was always this size and configuration.